The term ‘de-escalation’ refers to switching from a more potent to a less potent P2Y12 inhibitor. The rationale surrounding de-escalation is that the magnitude of the ischaemic benefit, including reduction of stent thrombosis, with the more potent P2Y12 inhibitors is mostly early, while the risk of bleeding complications accrues with the duration of treatment. Thus, a strategy of tailoring anti-platelet therapy to consider a more potent agent early after the index event followed by the use of a less potent agent once the ischaemic burden has hampered is indeed an attractive strategy to optimize clinical outcomes (ischaemic and bleeding). The main concerns surrounding de-escalation are largely attributed to the well-known notion that the pharmacodynamic (PD) effects of clopidogrel are subject to broad inter-individual variability with a considerable number of subjects presenting with high on-treatment platelet reactivity (HPR), a well-known marker of thrombotic complications. 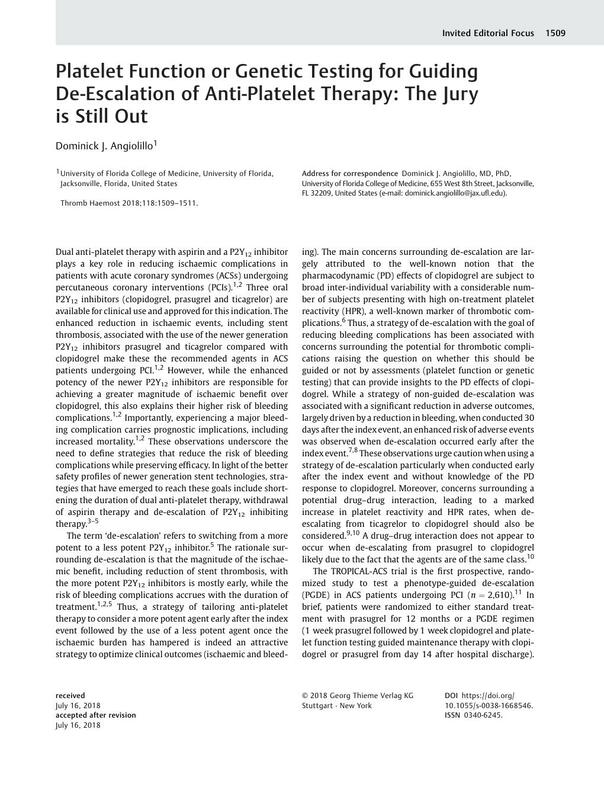 Thus, a strategy of de-escalation with the goal of reducing bleeding complications has been associated with concerns surrounding the potential for thrombotic complications raising the question on whether this should be guided or not by assessments (platelet function or genetic testing) that can provide insights to the PD effects of clopidogrel. While a strategy of non-guided de-escalation was associated with a significant reduction in adverse outcomes, largely driven by a reduction in bleeding, when conducted 30 days after the index event, an enhanced risk of adverse events was observed when de-escalation occurred early after the index event. These observations urge caution when using a strategy of de-escalation particularly when conducted early after the index event and without knowledge of the PD response to clopidogrel. Moreover, concerns surrounding a potential drug–drug interaction, leading to a marked increase in platelet reactivity and HPR rates, when de-escalating from ticagrelor to clopidogrel should also be considered. A drug–drug interaction does not appear to occur when de-escalating from prasugrel to clopidogrel likely due to the fact that the agents are of the same class. The TROPICAL-ACS trial is the first prospective, randomized study to test a phenotype-guided de-escalation (PGDE) in ACS patients undergoing PCI (n = 2,610). In brief, patients were randomized to either standard treatment with prasugrel for 12 months or a PGDE regimen (1 week prasugrel followed by 1 week clopidogrel and platelet function testing guided maintenance therapy with clopidogrel or prasugrel from day 14 after hospital discharge). Platelet function testing using the Multiplate analyzer identified HPR status after de-escalating to clopidogrel in 40% of patients in the PDGE arm who then ‘escalated’ back to prasugrel therapy. The primary endpoint was net clinical benefit (cardiovascular death, myocardial infarction, stroke or bleeding grade 2 or higher according to the Bleeding Academic Research Consortium criteria) 1 year after randomization (non-inferiority hypothesis). TROPICAL-ACS showed that a PDGE approach of anti-platelet treatment was non-inferior to standard treatment with prasugrel at 1 year after PCI in terms of the primary endpoint of net clinical benefit. A PDGE was not associated with any increase in ischaemic events, while there was a trend towards reduced bleeding (secondary endpoints). The lack of statistical significance on reduction of bleeding may be attributed to the fact that the benefit of de-escalating to clopidogrel could have been offset by the non-negligible number of patients who required to escalate back to prasugrel. Notably, a subsequent analysis of the trial identified an interaction on the net outcomes driven by a significant reduction in bleeding according to age, in which younger patients benefited most from a PDGE strategy. In this issue of Thrombosis and Haemostasis, Gross et al report the results of a pre-defined analysis of the TROPICAL ACS trial in which genetic testing using Spartan RX was utilized in 603 patients. The authors observed that on-treatment platelet reactivity in subjects treated with clopidogrel varies significantly according to genotypes, while this was not observed for patients treated with prasugrel. Accordingly, a LOF genotype was associated with a higher prevalence of HPR among clopidogrel-treated patients. These observations are in line with prior investigations in the field. However, in this investigation LOF and GOF genotypes were not associated with risk of ischaemic or bleeding complications, respectively. The findings from the genetic analysis of the TROPICAL ACS trial, while not apparently encouraging for the field of genotype-guided therapy based on the clinical outcomes of the study, need to be interpreted in the correct context. First, the study was conducted in a sub-group (23% of the overall trial population) which was not powered for clinical events. Moreover, after randomization, patients in the guided arm were stratified according to results of platelet function testing. Thus, the lack of association between genetic information and clinical outcomes of the study need to be interpreted with caution. Nevertheless, the study provides encouraging data that raises hopes for using genetic testing as a strategy to define the choice of P2Y12 inhibitor in clinical practice. In fact, the study supports the feasibility of using rapid genetic testing in a population, which while enrolled in a clinical trial, were representative of a real-world population based on the clinical characteristics and complexity of PCI procedures. Importantly, the clear association between specific genotypes and PD profiles are hopeful for studies of tailored therapies using the results of genetic testing. In fact, while preliminary results of genotype-guided approach have been encouraging, results of several randomized trials currently on-going will ultimately define the clinical value of such strategy. Indeed, the benefit of genetic testing over platelet function testing is that the results of the former remain unchanged while the results of the latter are subject to intra- and inter-individual variability. Indeed, it may be argued that ‘PD phenotype’ may be more predictive of future events given that it more directly correlates with the ‘clinical phenotype’, while genetic results represents just a ‘piece of the puzzle’ contributing to the PD response. However, the potential simplicity of a genotype-guided approach which would not require multiple switching and conducted at the time of PCI are indeed hopeful attributes that may favour the uptake of a genotype-guided de-escalation approach pending the results of currently on-going, adequately designed clinical trials. 12 Sibbing D, Gross L, Trenk D. , et al. TROPICAL-ACS Investigators. Age and outcomes following guided de-escalation of antiplatelet treatment in acute coronary syndrome patients undergoing percutaneous coronary intervention: results from the randomized TROPICAL-ACS trial. Eur Heart J 2018; DOI: 10.1093/eurheartj/ehy332. 16 Gross L, Trenk D, Jacobshagen C. , et al TROPICAL-ACS Investigators. Genotype-phenotype association and impact on outcomes following guided de-escalation of antiplatelet treatment in ACS patients. Thromb Haemost 2018; 118 (08) DOI: 10.1055/s-0038-1667337.